Formulate® Designer Series 10ft Fabric backwall Kit 01 has unique stylistic features and shapes, is portable and is easy to assemble. The two aluminum tube frames feature spigot connections and zipper pillowcase fabric graphics. A curved panel draws the eye, and integrated monitor mount that holds a medium monitor makes it easy to incorporate digital messaging. Designer Series Kit 01 comes in twp portable, wheeled transit cases for easy storage and transport. Assembly and graphic attachment is easy – simply pull the pillowcase fabric graphics over the frame and zip. Another great 10×10 booth for product company’s, the Hi Fun display has hanging racks as well as a lot of graphical space to really wow onlookers. Bring in traffic by placing the focus on what sells itself — your products. 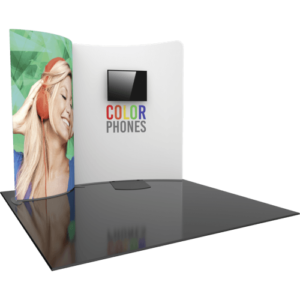 Then grab attention by adding visual add-ons such as trade show banners, pop-up displays, and counter displays for handouts. With two, tower-like pillars and a large graphic back wall, this display design begs for attention while showing off your company with two well lit monitors. Get creative with this one and make it your own. We have professionals that can help any trade show professional optimize their space in a way that will stand out and drive traffic. Get your booth started with a nice 10×10 four panel backwall with lighting that brings attention to a large, interchangeable graphic space. Use spotlights to make your graphics pop- or possible fabric with lights coming from the inside of your exhibit walls. Talk to our team of professionals to help gather ideas of how to make your exhibit the best in show. 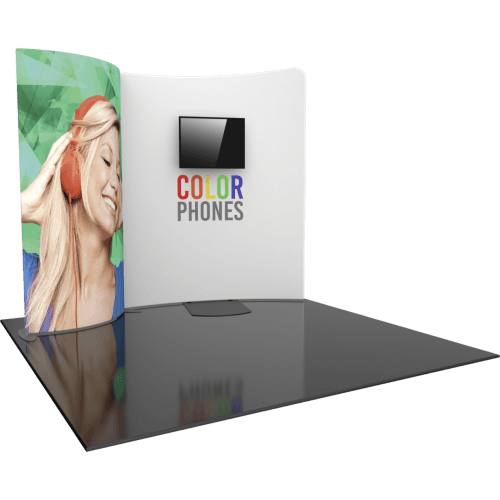 This trade show booth idea is the best for retail product company’s looking to show off their materials. The 10′ Design exhibit features back walls perfect for hanging products and using custom graphics to stand out.